Right, I’m not going to lie. When I reviewed Microgaming’s jungle-themed Untamed Bengal Tiger, I have to admit, I was blown away. The slot looked good, it felt smooth and it entertained the jock strap right off me. However, when I then moved on to review the follow up slot Untamed Giant Panda, I felt a bit deflated because it felt like a cheap release. As you might understand, I entered reviewing this Untamed Wolf Pack slot review with cautious trepidation suspecting that maybe online slot developer Microgaming had sold us slots fans short down the river again with basically another Untamed Bengal Tiger rip off. Wasn't it George Michael who sang "once bitten, twice shy"? I had certainly been bitten before when it came to the Untamed slots series. Sadly, I was right to be pessimistic. This 5 reel, 243 ways to win slot makes the same mistakes that Untamed Giant Panda made except it replaces the Brilliant Wilds, which was actually one of the great things about that slot, with something called Running Wilds. Instead of the Wilds sticking on the free spins, the Wild symbols now expand by one space with every spin during the free spins. It kind of feels like Brilliant Wilds on steroids. Admittedly, it does add more to the slot but it does feel like a feature that has been changed for the sake of changing it. 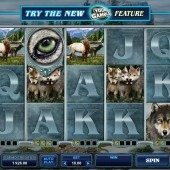 Everything else in the slot pretty much remains status quo for the Untamed slot series. The symbols consist of various wolves in different poses. Oh, look, there’s a wolf staring moodily into the distance. Oh, and over there, it’s a pack of wolf cubs huddling together. Then there’s the eye of the wolf Scatter that triggers the free spins bonus round when you hit three or more of them across the reels (or manage to randomly nudge one onto the reels with the Lucky Nudge feature). Oh, and there’s some moose… mooses? What’s the plural for moose? Just moose? A herd of moose? Anyway, enough moosing around. 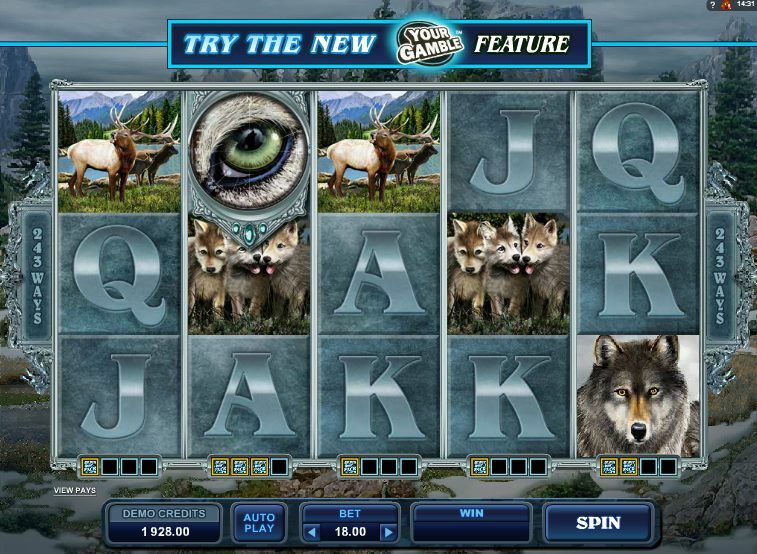 This slot does not miss out the Collect a Wild that is one of the great things about the Untamed series and one of the main reasons players keep coming back for more. Every time you hit a Wild on a reel, it will then be added to the collection of Wilds at the bottom of the reel. If you collect four Wilds on that reel then the reel will turn completely Wild. Once again, slot developer Microgaming has used a proven formula and manipulated it to release another replicated Untamed series slot. If you looked at this slot and thought you would be getting an evolved version of Untamed Bengal Tiger, think again. I can’t help but feel that Microgaming have been treading water with this series. Untamed Bengal Tiger was so ground breaking but the series hasn’t added anything and they are one of the same. It’s still not a bad slot and I would recommend it to play but don’t get your hopes up that it will thrill you in the same way Untamed Bengal Tiger will. I haven’t felt this unsurprised by a new release since Back to the Future III.